It took Virginia Governor, Terry McAuliffe, just few hours to tells white nationalists to go home (also they are labelled supremacists, Nazis, Ultra-Right, Far Right, Racists, Fascists, or Alt-Right). My grandmother can tell that this governor is either unaware of what he is doing, or being paid to do so. Charlottesville is not a race issue, it is about globalist control over USA and the world. It is an opportunity to unite USA. If African American and Hispanic are smart enough they must support White nationalists because if they don’t and let the Whites loose then definitely they will be next. To explain Virginia Violence in few simple words here it is: “It is a clash between Globalism led by Jews against Nationalism led by Whites”. It is a political confrontation but unfortunately some African Americans got it totally wrong. Jewishness or Judaism (earlier form of Zionism) is, like Zionism, not a religion, ethnicity, or nationality, it is squarely a political association nuder veils of religion and ethnicity. Those Democrats, Liberals, Soros’ people were and are the masters of slavery, human trafficking, exploitation not only in USA, but also in Ireland, Spain, Portugal, Italy, France, all Eastern Europe, Africa, and Asia. Now they pretend not to be racists and defend human rights and liberties. They have very dirty history and they are anti-Whites and anti-Europeans out of greed and evil. 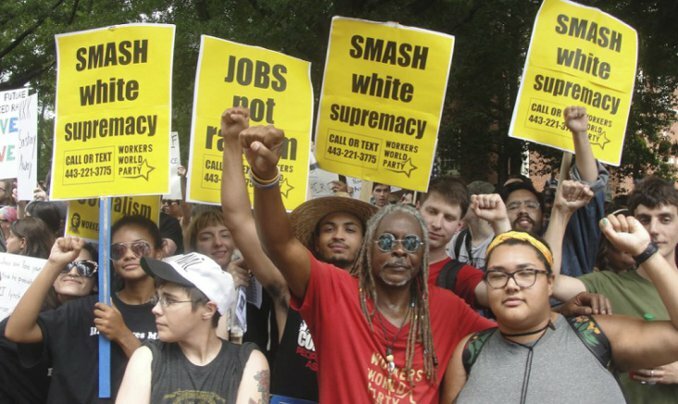 It could be expected to see arson attacks on Blacks to blame Whites, or the other way around; or even to fabricate attacks against Jews to accuse Whites or President Trump. Let us assume we are totally wrong and the Whites are terrible. Then how that governor is going to manage his state after he sided and decided that X group has no place in Virginia? Terry McAuliffe is surely unfit to govern. The White nationalists were protesting against the removal of a statue in a park and announced that for some days. It was legal and peaceful and has no intention to attack anybody. The groups of Soro’ s people including liberals, democrats, and gays organized and intentionally attacked the White nationalists. Any group is allowed to protest, but no group is allowed to confront and attack protestors in the same area. The White nationalist were right and Trump should had condemned attacking protestors by Soro’s thugs. White nationalists are not racists or fascists or whatever they label them, they are just patriots. The real racists are the slave dealers who are hiding behind fake religion, ethnicity, and nationality. White nationalists are hard working people they don’t live on usury and plotting. The smear campaign against Gaddafi was designed and carried out by the Jews who wanted to attack Europe by refugee flood to change its demography and politics. For them Libya was an obstacle that had to be removed. Now they are doing it via Libya, Morocco, all North Africa, and Turkey.